Midnyte Reader: A Great and Terrible Beauty. 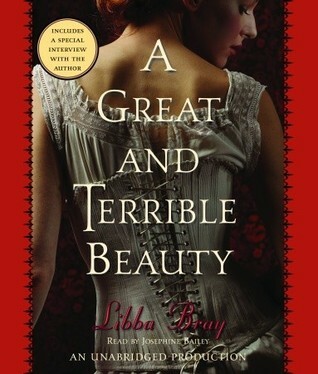 Title/Author: A Great and Terrible Beauty by Libba Bray. Favorite character: Felicity. Miss Hester Moore. My Thoughts: I just loved this book. 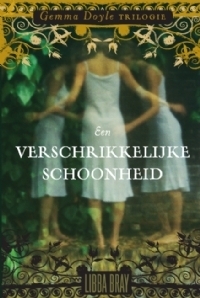 Girls on the edge of adulthood, a Gothic boarding school, secrets, magic and choices. I avoided A Great and Terrible Beauty for a long time because I thought it just sounded like too many stories I've read before. Maybe some elements are familiar, but I felt it was done so well. Gemma's voice took me in right away. I liked her and wanted to know her. I found her charming, and sensitive and very human with faults I find in myself. She is a great main character to follow as she leads the reader through her mother's death, her newfound power, her return to London and her exploration of what comes after. Now, usually when stories say "newfound power" I immediately get turned off. Why is it that at age 16 or 18 or some other magical number, people suddenly turn into superheroes or pyschics? It's just more believable to me when the characters have had their powers all along or at least a hint of it. Anyway, I digress. My point is that Gemma's "newfound power" was done extremely well. Although it is a large part of the plot, it felt natural and believable. I love stories that take place in England and I love stories that are set in the Victorian Era, so the setting is perfect for me. The Gothic boarding school and the secrets it holds lends itself to the haunting, spooky feel of the story. There were some moments where I could not believe what was revealed and was really taken for a loop. I also began to mistrust everyone because I suspected then of villainy or was just uncertain of their motives. Although the book is exciting to me, the pace is...not so much as slow, but just moves at a leisurely, purposeful pace. It's a quiet book with beautiful language and so many layers to dig deep into. It touches on the status of women in the Victorian Era without being preachy or the main focus, the culpability of one's own actions and living with choices and even the self hatred some teens experience. So many other characters are just wonderful too. I especially liked Felicity, the Queen Bee, mean girl. I figured that's all she'd be for the entire book. But she shows vulnerability, intelligence, insight and becomes just as important as Gemma. I also loved their art teacher, Miss Moore, who is a smart, caring and calm woman and who wants her students to open their minds and give their own opinions, not just what society dictates their opinions should be. Then there is Anne, Gemma's plain and dour roommate and Pippa, another classmate, the great beauty. They seem to be stereotypes correct? But they give the story so much more than meets the eye. The narrator has such a lovely voice. I absolutely adored listening to her. Her performance is wonderful and she captures differences in tone with subtlety and finesse. All the girls sound a bit different and I love how she conveyed personality into all the characters. I especially loved how she portrayed Hester Moore. 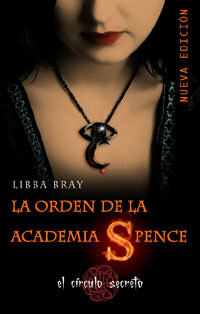 Even if I didn't love this book so much, I would probably continue with the series just to hear her melodic voice. I already have the next audio book waiting to be listened to. I took a look on Goodreads to see what others thought of it. There are quite a lot of varying opinions. Some people just absolutely hated it and most of the elements did not appeal to them. Others thought it was breathtaking. You can check them out HERE. I liked this trilogy at the time when I read it, but that was before my bookish world blew up (seriously, book blogs have expanded my book universe enormously). So while I liked it, I never really loved it, and I don't know now that I would have continued with the series... Although, the covers alone are swoon worthy and I do like the strong female characters this series has. But I bet the audio would be good, because books are always better with a great narrator! I just listened to Soulless and it was fantastic! It really brought the characters to life for me. I'll look up the narrator of A Great and Terrible Beauty and see what else she's done. Great review! It doesn't really sound like a book that would appeal to me but I just finished a historical fantasy book that I loved so you never know. I love the VIctotian era and like you the whole boarding school and mystery appeal to me. I do not mind a slow pace if its done well. I will be adding this to my list and thought your review was delightful. @Kate-I'm really not sure if I would have liked it as much if I had read it as opposed to listening to it. I guess I'll never know. I started Soulless twice, but never got past the first chapter. Maybe I'll give it a listen instead. @Karen-I don't know if I would recommend it to you or not...but I really loved the audio. That is why I included the link to opposing viewpoints! @Kimba-Thanks. I hope you enjoy this one. I really enjoyed this one as well when I read it awhile back. I never ended up writing my thoughts on it though so maybe I'll reread it before I continue on with the series. I'm glad to hear that you enjoyed it as well!